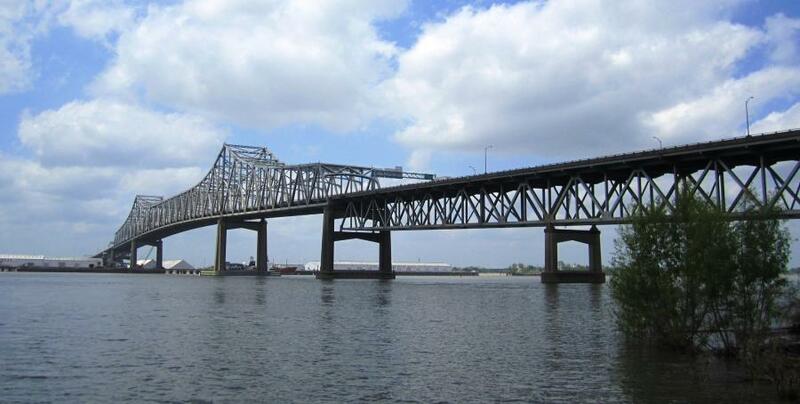 The biggest-ticket project is a $350 million widening of Interstate 10 from the Mississippi River Bridge to Interstate 12 in Baton Rouge, a daily chokepoint also considered one of Louisiana’s most dangerous stretches of roadway. BATON ROUGE, La. (AP) — Louisiana intends to use a federal transportation borrowing tool to construct $600 million in interstate projects that have been sought for decades to relieve traffic headaches, Gov. John Bel Edwards announced Jan. 12. The biggest-ticket project is a $350 million widening of Interstate 10 from the Mississippi River Bridge to Interstate 12 in Baton Rouge, a daily chokepoint also considered one of Louisiana's most dangerous stretches of roadway. Also slated for financing are a new access from Interstate 20 into Barksdale Air Force in Bossier City and another I-10 interchange in Kenner to serve a new terminal at the New Orleans airport that is under construction. “These projects impact three large areas of our state and are of the utmost importance for economic development and for convenience to the traveling public. The longer we wait, the more they cost and the more we lose,” Edwards said, announcing the roadwork plans at an event flanked by local elected officials. The plan requires legislative and federal approvals before the money can be used. The Edwards administration intends to use federal construction bonds known as GARVEE bonds, and repay the debt over 12 years with federal highway dollars the state gets annually, locking up some transportation dollars for future administrations. Local governments also are putting up some money to help pay off the debt. Shawn Wilson, state transportation secretary, said 25 other states have used similar financing mechanisms to do roadwork. He expects approvals and environmental clearances to be complete by the end of the year, paving the way for construction to start after that. The projects, Wilson said, will take years to complete because the state will have to maintain the flow of traffic on the interstates. Despite the excitement over movement on the interstate projects, Wilson also noted the backlog of road and bridge work has reached $13.9 billion. “This is addressing the tip of the iceberg of our needs,” he said. The Edwards administration sought to raise Louisiana's gasoline tax last year to chip away at the backlog, but the effort by Rep. Steve Carter, a Baton Rouge Republican, failed to win the two-thirds support needed in the state House. Critics of the tax hike said their constituents didn't want to pay more. Motorists in Louisiana pay 38.4 cents in taxes per gallon of gasoline, including 20 cents in state taxes. The state rate hasn't changed since 1990. Carter sought a 17-cent tax hike to raise $500 million yearly, with the tax rising periodically, tied to an inflationary index. Amid opposition, Carter then proposed a lower tax increase. But he still couldn't overcome anti-tax sentiment.